Wiky's Using console commands to find errors in your levels tutorial. 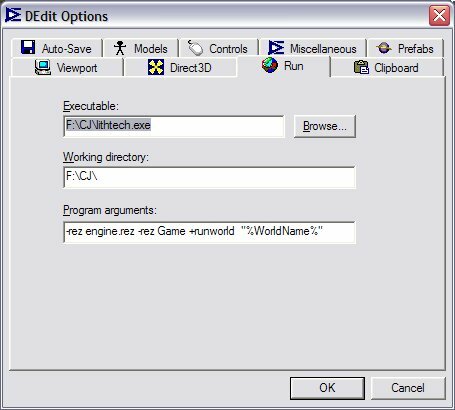 When setting up DEdit you have the option of using lithtech.exe or lithtechdev.exe under the run options. I happen to use lithtech.exe 90% of time since I use a nocd hack so that I don't have to wait for my CDROM to spin up to speed every time I want to check progress on my level. When I want to optimize my level, I'll throw in my copy of NOLF or CJ and switch to lithtechdev.exe. This allows me to enter in various console commands. To run console commands make sure you have lithtechdev.exe as the executable in the DEdit run options. Use the ~ (tilda) to bring the console down in game. Here is a list of some useful console commands. For a complete list of console commands, run a world in lithtechdev.exe and bring the console down (~) and press tab to cycle through all the commands. Usage: hit ~ to bring down the console, type showframerate 1 to turn on the frame rate, press the ~ again to return to the game with your fps counter in the top left. Use shift + ~ to scroll through the info once you've closed the console window so that you can see all the information.